World famous is the Glacier Express in Switzerland. 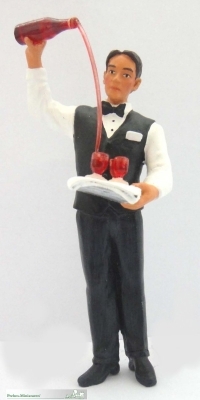 Soon, this train waiter will be delivered from the Glacier Express by Prehm miniatures. Since November 2012, the "skilled" waiter is available from us. The metal figure is, as usual from Prehm miniatures, produced by die casting, without the use of lead. The artistic painting is done by hand, with UV resistant colors, without toxins. The train waiter will be delivered to the garden rail customers in a noble packaging. This product was added to our catalog on Sunday, 13. January 2019.